Wishing you the very best New Year. Give yourself permission to fail trying if you have to, but try anyway. But I wish you success. I just saw King Kong this afternoon. I thought it was too long, its story was implausible and the whole experience was loud. 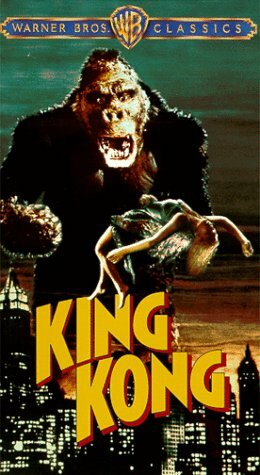 This movie doesn't bring anything to the King Kong myth or story that the beautiful 1933 original doesn't already have. You'll just have to believe me that I tried, mightily, to like it. Heck, I think my fellow audience members thought I was obnoxious in my constant chuckling throughout the first part of the flick. I think the movie is nothing short of terrific in the suspenseful expositional segment. We know that this story is headed for some very incredible events and I loved the way King Kong milked that for all it was worth. The movie starts going downhill when we see the big monkey. We are then induced to slumber when long, lingering love gazing predominates between the monkey and the blonde. This, interspersed with lengthy cgi sequences. I was glad when it died so I could go home. Here's a news story that really shouldn't be too much of a surprise. A number of Catholic cardinals are warning Italian women against marrying Muslims. Church officials say some 20,000 mixed marriages took place this year alone, the BBC reported. The Catholic Church's official position is to encourage dialogue between Rome and other religions, including Islam. But two documents published in Rome have called for extreme caution by Catholic women contemplating marriage to a Muslim, the BBC said. It's tough enough for two Catholics to succeed at marriage. Mixing the personal cultural learnings of Catholicism with Islam brings mighty obstacles to overcome. Of course, love can overcome all things. But caution is advised. I got this groovy ecard in my inbox today. Passing it on to you. The Star Tribune is dedicated to deep and rigorous reporting, unwavering accuracy and the daily story of life in the Twin cities and Minnesota. We cherish your trust, and thank you for reading this newspaper and StarTribune.com. I could be wrong, but I think this little note of appreciation is new to the paper. I asked my dad about it and he's never noticed anything like it before, either. Firstly, a note like this tells us that the Strib is finally coming to recognize that it is seen by many readers as being arrogant and partisan. Secondly, I think it tells us that the publisher realizes they are losing circulation numbers and have to stick their thumb in the dyke to try and stop readers from running away. This is a good sign. We want the Strib to stick around and survive as a healthy newspaper. No one is served well if the paper disappears and we are left to seek new ways of finding information. Hopefully this is a sign that the StarTribune is keen on delivering on its pledge. Wishing you and yours a very Merry Christmas if you're a christian and a Happy Hanukkah if you're Jewish and a Happy Festivus if you're a Seinfeld fan. May our terrific men & women in America's armed forces have a wonderful day. I don't ask for anything for Christmas much anymore these day. I've received what I asked for with my successful second surgery. So I follow procedure with physical therapy. My arm hurts, but I'm on the mend. Sometimes an extra brandy on the rocks will help me through my pain. Today I'm wearing my new MOB t-shirt. I guess we could say it's my Christmas gift to myself. Leave a Comment and tell us what your best gift was today, won't you? I love fantasy and horror and movies and all three can be found in two movies showing at the Mann St. Louis Park Cinema tonight. Those would be the movie about bloggers from NARN and another movie about a big monkey. Does my construct cast the Deacon as the pantyhose? Well, only if Rocketman is the lion and Big Trunk is the witch in alphabetical order, of course. I'd better stop my parallelism right here right now. I saw Narnia: The lion, the witch and the wardrobe just now. I'm not familiar with C. S. Lewis' work, but as a pure cinematic experience, for me it sucked. Big time. It seemed very contrived and synthetic. Yet, a note or two. The little girl actress who played Lucy has a smile so similar to Gwyneth Paltrow, Hollywood should immediately commission a script for Paltrow in which she is seen as a 5 year old. This kid would be perfect. The Fawn character was really giving me the creeps. Every second that Fawn was on the screen was a painful moment. Tilda Swinton did a great job, but her director managed to waste her efforts with blandness. The ending doesn't matter. I was lucky. A bus came precisely when I reached the stop. If this is supposed to be a Christian message movie, then it's the hokiest piece of animation to come down the pike since Davey and Goliath. I knew I was going to see either this movie or King Kong, whichever one was showing first upon my arrival. Narnia won that game by fifteen minutes. It really didn't matter to me. I have decided to see King Kong very soon. Yes, yes, I know I'm going to squirm in there at probably a few points through this three hour long remake. And I'd love to be proven wrong. I know Peter Jackson is a by gosh genius, but I'd love to be surprised to find the three hours just slipping away. Checking out MOBANGE! today, the aggregate blog took only 60 seconds to download. That's at least a 100% improvement in speed. Doug promised he would work on making this great site faster. My guess is that he's not finished tinkering yet. The Late Late Show with Craig Ferguson has taken up a recurring gag that I really wish they would drop. Craig announces to his tv audience that it's been learned recently that President Bush "may have started drinking again." They then show a White House speech clip that's slowed down, sound slowed to a slur. It's so effective, it's scary. It really seems to be W sloshed to the gills. The gag is on the CBS website as well. Check it out and understand how lefties who hate W are so frustrated they can't impeach him, they can only mock him and ridicule him. Is this what comedy has come to on our nation's television screens? Ferguson takes a known fact about W's past, his youthful drinking, and creates the strangely disturbing illusion that this president who is contested daily for his decisions, is nothing more than a drunk. For what it's worth, there was a guest on his show, a veteran of Operation Iraqi Freedom, who Ferguson never bothered to thank for his service in the U. S. military. Ferguson could only bring himself to express his relief that this man who served was never killed or wounded. After all, this would be a waste, would it not, to die or get maimed over the actions of a drunk. Am I saying that Ferguson should have his license revoked? No. It's an hilarious talk show, imho. I'm not advocating a boycott. I've just got my eyes open to these extraordinary times we live in. UPDATE: Dwight Yoakum is Ferguson's guest tonight. He's doing a country music duet with Craig, who does a sweet and endearing Bing Crosby impression. Yoakum jokes, in mid-strum; "This is almost like Bing and David Bowie, eh?" In a moment, Craig's guest will be Terri Garr. Miss Garr was discovered on a favorite tv show of the 1960s. As the president's supporting critics have been urging repeatedly these past months, he must continually tell the American people why we are in Iraq and why we must win. He did that last night from the Oval Office. A quick survey of blogs in support of the president give him good marks for a good speech. As has been noted, the speech really didn't say anything new for anyone who is familiar with the issue. But the hostile msm we see operating in this country today has been projecting a distorted picture. I'm flabbergasted to come to grips with this, but there are actually millions of Americans who might very well believe that Iraq is a quagmire, that the Army is broke, that our military is terrorizing Iraqis...ad nauseam. So the president must tell the people what's really happening. Our so called "Fourth Branch of Government", the main stream media, is the one that's broke, not the Army. He repeatedly talked about "my decision to invade Iraq," even though, of course, it was also Congress's decision. He made very clear that, ultimately, this was his war, and the decisions were his. Why did he do that? Because he thinks we're winning, and he wants credit. This sounds true to me. After all the pummelling W has taken for making that tough decision, he darned well better get credit for making the right call as Iraq proves successful. I won't be holding my breath for that credit to be given to him tomorrow. But I full well expect history to get it right, but I hope he's recognized for his brave decision by the time he's retired from the White House. After all, the BHS barking moonbats and the Democrats are a very stubborn lot. And as we've already seen, the msm has dug their trenches and show no signs of admitting that their view is dead wrong. I'm listening to the NARN rebroadcast from yesterday here on this quiet Sunday evening. I was unable to hear it "live" yesterday as I was at my BPOU Christmas party. "And the proponents of this ban talk of preserving FREEDOM for bar-goers. Well guess what. Hitler claimed the very same thing!" It is a very sad thing for me to observe that my friends and fellow MOBsters are actually taking pages from MoveOn.org in their vitriolic attacks. And I suspect I know why; Because they are losing the battle. I've been reluctant to go toe to toe with my friends over this issue because I've suspected all along that the news that Terry Keegan brought to the broadcast would come to fruition. Terry reports that a statewide ban on smoking in bars is inevitable. Why should I strain my good spirited relationships with my fellow bloggers over this issue if there's no reason for me to raise their ire? Another reason I am reluctant to argue with my friends is that they are so out of control, as yesterday's NARN show demonstrated very clearly. They scream of the arrogance of the ban proponents. They rage over the disingenousness of the pro-ban folk. But my friends should not confuse me with those bitter elements, for I am none of those things and have not joined any of those pitched ranks. So why do I bring up the subject now, if I claim I am reluctant to argue the issue? Because the best political talk show on radio, The Northern Alliance Radio Network, made it a topic of discussion. Just because I disagree with the boys over this one doesn't trump the quality of this great show. I respectfully disagree with them. And if being in opposition to the ban makes those folks More Conservative than Thou, then I'll concede that I'm not held in such high esteem as they are. Is that a sin? I still maintain the issue is a health issue. I applaud the ban. The sooner it goes statewide, the sooner the local business competition will compete on a level field. I slept well last night for the first time in weeks. Beginning in the early afternoon I attended my local BPOU Christmas party. We had food and Elephant beer and political talk. State Deputy Chair of the GOP, Eric Hoplin and Minnesota's "Mr. Republican", Lyle Schwarzkopf were generous enough to attend and deliver speeches on the political battles to come. Both of these men are terrific orators and they had great ideas to put forth and great challenges to present to us. And of course, these parties are always fun because it's an opportunity to see all the great new friends I've made since I joined up with the GOP. The Winter MOB Blogger's Bash was my next stop. Rob and Teri were kind enough to give me a ride to NE Mpls. at Keegan's Irish Pub. The whole gang was there. For some excellent photoblogging, check out Hammerswing75...even though yours truly isn't in the mix. A fine time was had by all. I met some new bloggers and I also bought a MOB t-shirt from Chief. At one point, I was crossing the room and passed James Lileks who was the center of attention of half a dozen young women. "James", I cried. "Leave some of the women for the rest of us, will ya?" Moving on without pause, I left it to James to inform the ladies that the handsome and mature gentleman who'd made the snarky comment was none other than pinkmonkeybird. I'll be looking for an upturn in my Comments in coming days as these ladies come to realize that James is happily married. And of course, I quaffed a few Guinness Extra Stouts the whole time I was down at the bash. Rob & Teri dropped me off at home before it got too late. I'd had enough excitement for one day. My doctor recently give me a prescription for vicodin to help me sleep. After brushing my teeth, I popped one of those and dreamed sweet dreams of John Kerry's censure, Mark Kennedy's victorious election as U.S. Senator and bin Laden's capture. Gee. Nothing like good drugs to reconstitute one's soul. UPDATE: It seems that I've made it into Part 4 of the photoblog. When I was at the U of M campus in the summer of 2004 for a Bush rally, I happened to run into a friend and client who is a liberal Democrat. He and I got into a brief discussion of W. My friend warned that we must not allow W to be reelected because he most certainly would be impeached for illegal activities if he were, and our country just can't survive that kind of dishonor and that kind of blow to stability. I thought that was an absurd argument and that it mostly went toward describing the depths of Bush Hatred Syndrome more than it did the real world. But I must say that my friend's words came crashing back at me when I read the headlines the other day of Bush's questionable and probably illegal wiretap authorization through the National Security Agency. Was this the fulfilled prophecy?, I wondered. Last night on the Jim Lehrer News Hour, David Brooks chided the White House for not at least explaining to the American people why he did it and how it is legal. So it's with quite a bit of relief that I read in Fox News today that the president has done just that. This authorization is a vital tool in our war against the terrorists. It is critical to saving American lives. The American people expect me to do everything in my power, under our laws and Constitution, to protect them and their civil liberties and that is exactly what I will continue to do as long as I am president of the United States," Bush said. This is satisfactory for me to be able to sleep nights and remain faithful to the president. White House counsel has examined this procedure and found it to be within the law. That's good enough for me. I understand that bad guys are trying to kill us. I want my president doing everything he can within the law to protect my safety and the safety of the country. I have no objection to the NSA's wiretaps. They are welcome to wiretap me, as they will find nothing worth bothering over. The Bush Administration, once again, seems to understand that if they do anything illegal or try to cover up any illegal activity, will be found out by a hostile press and will be brought down like Richard Nixon was. They therefore devote much energy toward remaining within legal bounds and toward showing transparency of legality. Of course, that's not good enough for the barking moonbat Chimpy McBushitler BHS lefties and the hostile liberal biased msm and the opposition-at-any-price Democrats. CLARIFICATION: As I've been learning more about the NSA wiretaps, I've come to understand that I and most Americans have nothing to fear in the way of wiretaps on ourselves. So, regarding my line; "They are welcome to wiretap me, as they will find nothing worth bothering over." There is no reason for any American to worry that his or her phone is being tapped unless he or she is phoning terrorists overseas. Most of the taps were conducted on non-citizens who fit that profile. Tom Bevan has this post , The Media's Incurable Myopia, at Real Clear Politics. Iraq is tough, to be sure, but it's far from a disaster. The only thing missing from the picture today is knowledge of history and context. I'd be very much distressed over the msm's failings if it weren't for the fact that newspaper subscriptions are shrinking and we now have right wing political talk radio and the blogosphere. Those elements bring levity and they maintain confidence in the marketplace of information. After all, that's what alternative media is; the satisfaction of marketplace demand. The msm may be broken, but our freedom of the press still works just fine as market demands find a way to get information to the people. And better still, the Internet has innovated ways to facilitate the will of the people to be communicated to the general public as well as the halls of power. We're gonna be just fine. Last night I was shopping at the Kowalski's grocery store at 25th & Hennepin Ave, S. in my Uptown neighborhood. There, in the butcher/meat area, was my former vice president, Walter Mondale picking out a steak in his shopping. I don't agree with Mondale's politics, but I've never run into a former vice president at the grocery store before, so I was a bit star-struck. The first thought that enters the mind is to say "Hello. You're Walter Mondale. You were vice president once. Wow! I'm blogging about my encounter with you!" This is quickly abandoned as over-excitable behavior. Then one thinks to simply say, "Hello, Mr. Mondale. Merry Christmas." And that thought leads to the realization that one should just let the poor guy pick out his steak in peace without being bothered. After all, what's the follow-up if he should say something back? "You & Jimmy Carter were the worst president and vice president ever."? Shortly after I strolled on down the aisle, minding my own business, I noticed that some other shopper had recognized him and said "hello" and engaged the man in conversation. Poor guy. It must be crummy to not be able to simply pick out a steak without being harassed by strangers. Pinkmonkeybird has been linking to Crossword Bebop quite a bit these past few days and here we go again. And for good reason. Douglas has created a Minnesota Organization of Blogs aggregator. He calls it MOBANGE! I've added this site to my blogroll. This is an amazing site. It aggregates all the blogs of the MOB with the top three freshest posts. With this site, anyone can survey what kind of chatter is going on in the MOB and do so all at one convenient address, all whilst listening to African mobange music. The winter MOB blogger's bash is to be held this Saturday evening, so I'm learning of this aggregator just in time to give it a great test drive. On this very Sunday morning, one can visit this site and handily pick up all the flow of the bash. Is that totally cool, or what? One word of warning about MOBANGE! You should be prepared for a load time of a minute or so...maybe two. In this fast-paced blogosphere we live in, that might seem like years of waiting. So once you're there, stick around in there and check out as much as you can. I'll be at the bash. Hopefully, I'll see you there. Last night I was on a winning team at Keegan's Trivia Night. We scored 21 out of 25 correct. But the Trivia Quizmaster gave the 1st place award to the other tying team because they had only three members to our four. For a complete play by play check out Crossword Bebop, who somehow managed to liveblog the event without incurring the harsh disciplines of the Quizmaster's wrath upon us. I do not understand how Doug got away with being online in the course of the game. I've seen other bloggers try to do this and they were immediately instructed that they could not play whilst online. Could it be explained because we named our team "No, We're Not Cheating,"? Somehow that seems very naive to me. Anywho, this was my second win at Keegan's Trivia, thanks to my sponge-brained teammates. Thoughout my life, I've always been under the false impression that the Lord's Sixth Commandment forbids any man or woman from killing another man or woman under any circumstances whatsoever. If my confession doesn't already tip you off, I am not a Biblical scholar. In fact, there's very little of the Bible that I've even read. Perhaps I should. In other words, I had thought that every soldier in the world and in the history of the world commits a sin when he or she kills. It was my assumption that this killing must be atoned for as a violation of God's Law. After all, would the Pope kill someone who was going to kill him? Would Christ kill for any reason whatsoever? No. Of course not. I had thought the Ten Commandments was an expression of absolute devotion to God. It turns out that I am wrong. Last week I sent this matter to my friend and fellow MOBster, Doug Bass of Crossword BeBop blog, who has devoted some significant part of his interest in understanding Christianity. How is a soldier not violating God's law? Because the word for what a soldier does is not the word for "kill" that is in "Thou shalt not kill." Of course, we already know that the Muslim soldier is not violating God's Law when he kills. He's following the Prophet's example. I received my Republican National Committee 2006 wall calendar in my mailbox yesterday. It's a beautiful thing to behold. Each month features a wonderful, unique full color photo of the president in various actions. Here is one of my favorites. If you look closely at my small pic, that's Barny sitting in the cab with W.
This great president will be in office for only another three years, God willing. I cannot imagine that we'll be lucky enough to have another like him in 2008, so this calendar is a terrific way to be reminded daily of how blessed we are to have brave leadership in time of war. Political right wing radio is giving heavy airplay to a sound bite of Betty Dawisha, an Iraqi expatriate who happens to live in Indiana now, I believe. "Anybody who doesn't appreciate what America has done, and President Bush, let them go to hell!" Could any bite be more refreshing? I'd like to hear more from Iraqis who are displeased with the liberal leftist media spin on their country. Iraq is voting today and I am proud to be an American. I saw my attending surgeon this morning by appointment. Things are looking good. My x-rays show good healing. My doctor showed me a space he'd cut in my radius that he had to create in order to access areas. That space is not yet healed, but that's to be expected. In short, there were no surprises. I'm on track. I'm still swelling at the elbow, but my doctor is not alarmed by this and believes it will gradually reduce. He gave me a prescription for vicodin so that I can sleep nights undisturbed. I'm planning on using it only at bedtime. During the day, Extra Strength Tylenol should suffice. But I am weaning myself off of painkillers. Chief of Freedom Dogs warned me months ago that this sort of injury makes it easy to gain unwanted weight. I stubbornly replied that it was my intention to do the opposite and lose weight while I was laid up. I was wrong. I've gained about ten pounds. But, you know what? I don't care. While I've been laid up, I've been slothful and lazy about many things. Yes, I allowed the scourge of Hostess Ho Hos to dig their hooks into my soft flesh, but I was comforted by them like an invalid soldier is comforted by a young nurse with a tight behind. I've been focused on healing myself. When I go back to my day job next month I'll rejoin the rat race, resume the daily exercise and get myself back onto a sensible diet and lose the weight. Heck, Robert DeNiro did it, so can I. My surgeon thinks I'm ready now for "resistance" exercises in my physical therapy. This is also known as "strength" exercise. These consist of simple exercises that entail utilizing my muscles in more ways than simply lifting the weight of my arm. These kinds of exercises are crucial in the healing process. Things are looking up. Thanks for all your caring and concerns, dear reader. I'm gonna be okay. The other day I was listening to a bit of Bill Bennett's Morning In America show on The Patriot. Bill Bennett, besides being a political pundit and former drug czar and former Secretary of Education, is also a classic rockandroll fan. A listener called in to tell Mr. Bennett of a great surf rock band that has a great holiday music album; 'Tis The Season for Los Straitjackets. I can vouch for this album. It's a terrific disk to put on during the Christmas season. My fave tune would have to be Feliz Navidad. It has to be heard to be believed. Los Straitjackets will be in the Twin Cities on Dec. 30th to play a live concert. See you there? Late last week I saw the new biopic on Johnny Cash; Walk The Line. I was pessimistic about this movie. There are more ways to get things wrong in a biographical movie of a great American icon than there are to get right. But my fears were unfounded. This movie rocks. I'm not an expert on Johnny Cash....I'm just a fan of his music. I haven't read the books this movie utilized to tell his story. But I've read a few liner notes from Cash's albums and I've read a few historical accounts. Sure, the movie takes some dramatic liberties with the subject matter...we expect that. But it gets the basics right and it doesn't shrink from the ugly parts of Cash's life. One of the amazing things about this movie is the performances. I actually came to believe I was watching June Carter Cash and Johnny Cash. The actors really went the distance and got the mannerisms down pat. The artistic design is top notch, too. The feel of the era these people lived in is captured like few others I've seen. T-Bone Burnett is responsible for the soundtrack. He won an various awards for his work on the Coen brothers' movie, O Brother, Where Art Thou? And I expect he'll win the Oscar this year for his work here. The script is good and tight. One of the ways I gauge a script is if I check my watch while a movie is rolling. I didn't care what the time was. Each scene moved the story forward and there are some very nice resonances written therein. Sometimes we talk of a movie's arc. This movie arcs nicely. It doesn't take a genius to predict that Cash's drug abuse will bring us to the low point. This movie is ultimately a love story and a true story, as June saved Johnny through her faith in him. I'll be watching Walk The Line again someday, as I do most movies I like. If you like Johnny Cash, you'll like this film. I enjoyed it, as did my mother & father, with whom I watched this movie. I just read the president's latest speech, delivered today, regarding Iraq. It's been hailed as a great speech and I wholeheartedly agree. It's wonderful that W is fulfilling the requirement that so many supporters had insisted upon; that he should almost daily tell the American people what is going on in Iraq, what our challenges are, what the stakes are and that we will remain firm. This speech does all of those things and it is merely today's, following many others and presumably to be followed by many more. Now, no one can say with a straight face that there is not plan and we don't know what we're trying to achieve in Iraq. They'll say it, just the same. I don't have much in the way of analysis of this speech, though I found it informative and reassuring. Many of the things I had hoped I understood about today's Iraq were reinforced by the president's words. One issue that confuses me just a wee bit is how to measure the success of this Thursday's elections. I've been seeing a number of opinions put forth that seem to say that this Thursday will once and for all, if not silence the critics of the war, will go a long way toward proving success there. That will probably be true for objective, honest folk. But the anti-war crowd will not accept any degree of success in this new election as proof they were wrong. What's to stop them? Facts never mattered before. Why should they matter now? They will claim that Iraq's democracy is illegitimate and is nothing more than a US puppet state. There's never been any shortage of silly people. Today's world is no exception. During the blazing hot war in Iraq back in 2003, there was a factor known as the "tipping point". The tipping point is when the tide turns...it's when the defeated know they are defeated and a common consensus is gained that tips the issue toward a decision. There seems to be a feeling in the air that we are quickly approaching a political tipping point on Iraq. As most folks know by now, President Bush will be in Minneapolis today for a Kennedy fundraiser. Naturally, there will be rallies. Since I'm on physical disability these days, I've got time to show up at 13th & Nicollet today at 11 am to rally for the president before I trot off to my physical therapy session. UPDATE: I write this at 3 pm local time. I went downtown today, as promised, to join any pro-W rally that might have been organized. There wasn't. I also discovered that I had the address wrong. The barking moonbat demonstrations were at the Hilton Hotel at 10th and Marquette Avenue. I found 4 specific street corners at the hotel where the radical lefties staked out their ground. Palestinian flags were in abundance. Old Glory was flying upside down. Placards referred to Bush's "Death Camps". This was a very radical group of America haters. Combine the fact that I saw no counter-rally with the bitterly cold air today and it was a no-brainer for me to leave. So I popped on in at Brit's restaurant on Nicollet and tried their bangers & mash before hopping the bus to see my physical therapist. So far as I witnessed, I was the only Bushie exhibiting support for the president on the street today. I'm listening to the smartest radio show in America again; The Hugh Hewitt Show. He's, as I am wont to say, "on fire" with the issues tonight. Fortunately, I am not speaking literally. I predict that Hugh will have a bad case of laryngitis, or at the very least, some croakiness in his voice, tomorrow. That's because he's not following my advice and speaking in resonant tones. He's bleating to the skies and his voice is close to unbearable to listen to. The Democrats are to blame for this. Hugh is all bound up in outrage over Howard Dean and John Kerry. Hugh; for the love of Mike, please try to relax. You've got the facts on your side. There is no reason to throw a fit. UPDATE: Well, I'm listening to the smartest radio show in America again this evening, and Hugh's voice isn't the least bit damaged. But he's giving me a headache. I wish he'd stop straining his voice. To make matters worse, when the show goes to commercial break, The Patriot often plays a series of Hugh Hewitt commercial messages. They are even worse than Hugh's on-air voice. We've turned the corner in Iraq. We've turned the corner on the homefront, as well. Just this morning I heard George Will express an interesting idea on the Laura Ingraham Show. He posits that Iraq may well become an asset, politically, for the Republican Party. It's not difficult to follow and it goes like this; The Democrats are riding nearly all of their chips on Iraq 's becoming a failure. (Indeed, they think it has been a failure since shortly after they voted for its funding in Congress.) They are broadcasting a message that looks very much like an advocacy of defeat at any price in Iraq. But what if Iraq becomes (as I believe it is becoming) the stellar success story of the century? A black hole that the Democrats will find even light itself will be impossible to escape from. Now we have Howard Dean insisting that the US Won't Win in Iraq. He said the Democrat proposal is not a 'withdrawal,' but rather a 'strategic redeployment' of U.S. forces. It's really astounding, but the Democrats are, as Will observes, exhibiting insanity. A good definition of insanity is doing the same thing over and over and expecting different results. (A quick Google of some key words in that postulate brought me to a source that traces its origin to American Statesman, Benjamin Franklin). Now we have the Democrats positioning themselves, says Will, to run on the George McGovern platform. Will is not chalking rocket science on his blackboard. I think every pro-war advocate hoped that this war would be successful and bring coat tails. Is it possible that the negative din has been so protracted, so mounting, the Democrats began to believe their own "Quagmire" stories so fervently, they are hurling themselves off a cliff? If that's so, then we may have Republican victories as far as the eye can see. My arm hurts. My arm hurts now more than it it last week. This is distressing, as I naturally want to see less pain from day to day since my bicycle crash and subsequent surgeries. But it doesn't work that way. If I give in to the desire to watch pain fade away, I will be a man with one good arm and one frozen, near-useless arm. Needless to say, I don't want that. I want my arm back 100%. My doctor tells me I'm not getting my arm back 100%. If I work hard and bear the pain of exercise, I'll be lucky to get back 98% of my arm. So I exercise. So I inflict and withstand pain. Last week, my doctor examined my arm and found that it's healing well. He wouldn't go so far as to proscribe a strength physical therapy regime. But he did tell me that he wants my physical therapist to become "more aggressive" in motion exercises. I took my new orders to my therapist, but she was a bit hesitant to embrace his advice. She wanted to phone him and learn more precisely what his instructions were. I lost a week of aggressive self-administered exercise upon myself because I was fooled by these two professional offices in their arm-wrestling. I am trying to be a good patient, so I try to follow instructions from these folks as closely as possible. No one told me to aggressively exercise my arm, myself. I dutifully took the news to my therapist and then she wasted a week in conferencing with my doctor. That was my mistake. My first-hand experience with these health people tells me that, if you'll pardon my expression, the left hand doesn't know what the right hand is doing. Maybe it's incompetence. Maybe it's fear of litigation. I don't know. My therapist accused me of "arguing" with her yesterday because I kept asking questions. That bothered me. I thought about dropping her services and finding a new therapist. But I devoted some deep thought over the situation and decided that that's probably not necessary. What is necessary is simply to embrace the fact that my own personal health is in my own hands at this point. Most of the rehabilitation I stand to gain will ultimately come from my own self-administered exercise regime at home on a day to day basis, two to three times per day. So I've begun to do 20 repetitions of arm curls, three times per day. It's difficult. This is a motion that was, before my accident, done with very little effort. I used to do 3 sets of 8 curls per day with 50 pounds of weight. Now, it's important to use no weights. My doctor wants range of motion exercises; not strength or resistance exercises. No argument there. Just making the range of motion is difficult enough for me. My therapist observed that I'm not breathing naturally when I do this exercise. Once again, I have some problems with the way my therapist presents this coaching to me. She operates from a negatively critical point of view. Why? It seems to me that she should be adept at understanding where the patient is coming from. Of course I'm not breathing naturally! It hurts like hell! Once again, some time alone, contemplating the situation helped me realize that just because my physical therapist and doctor are not perfect, is no reason to give myself short shrift. I take their information, no matter how ineffectually presented to me, and utilize it. So I now concentrate on breathing regularly and naturally as I flex and extend. My opinion of health officials and health specialists has taken a severe downgrade. But I'll be damned if I will let that get in the way of my complete recovery. Kevin McCullough of WMCA radio has a great idea. He's sending a religious Christmas card to the American Civil Liberties Union. You know, the folks who want to wipe Christianity out in America. I can't think of a better way to express my Christmas love than to jump onto McCullough's wagon. Well, I'm sorry I haven't had much to say about political events or my arm or really much of anything this week. It's Thursday and that means Trivia Night at Keegan's Pub. See you there.